lf benefics are situated in the 6th,7th and 8th from the Moon or ascendant Adhi Yoga is formed. Adhi yoga makes a person polite worthy,healthy and he leads a happy life,surrounded with luxuries.It males one defeats his enemies and him live long. Adhi Yoga is one of the most important combinations which can not be overlooked. Astrological authorities classify this Adhi Yoga as Papadhi yogaand Shubhadhi yogi. As per Varahamihira only the three benefics Mercury, Jupiter and Venus can cause Adhi Yoga.All these benefics may be in the 6th, 7th or 8th or in two houses or all of them may be in any one of these houses. If there is one planet in full strength in any one of these signs, that person becomes a leader. If there are two he will be a minister and if there are three, he will occupy an important position in life. Adhi yoga is considered as a Raja Yoga or almost its equivalent. If these planets are weak then adhi yoga will be less powerful. Adhi yoga can be checked in divisional charts and any other important chart like Indu Lagna,Ghatika lagana or laabh mandook hora chart. 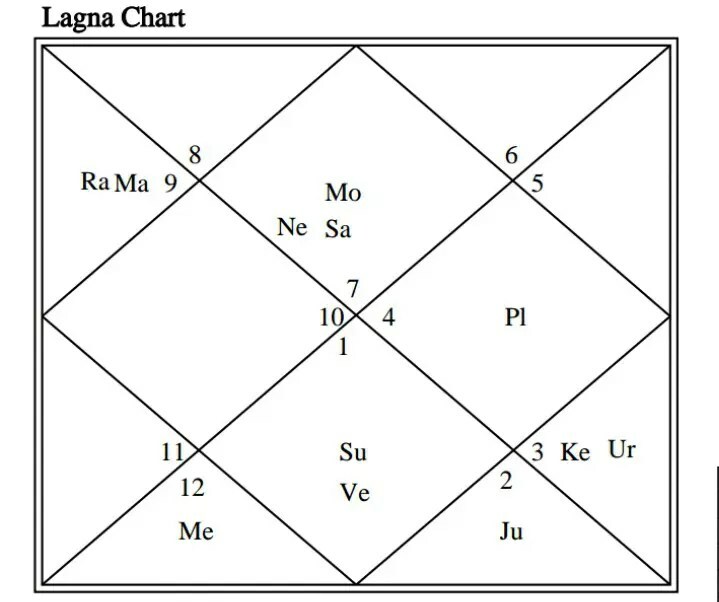 For example we can see in horoscope of Mukesh Ambani Adhi Yoga is being formed from Ascendant and Moon.Same time Adhi Yoga is formed in his Laabh mandook hora chart also. No doubt he is richest man of India and one of the influential personality. He is owner of worlds most expensive home.